Just last week I was in Los Angeles to learn more about a variety of movies and television shows. Let me tell you: I had a few friends who were more interested in my time with Ben and Lauren of The Bachelor Season 20 than anything else on the agenda! No wonder. fans of The Bachelor are loving Ben & Lauren: Happily Ever After?, the all new reality series that follows the couple as they move forward after the final rose! About Ben & Lauren: Happily Ever After? 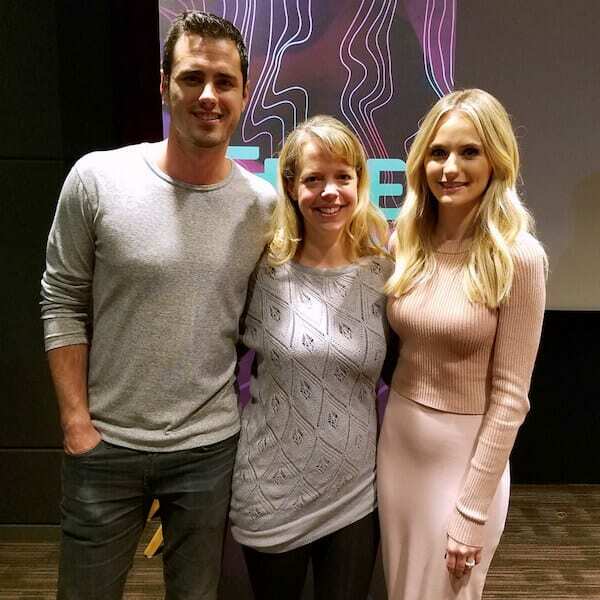 I had the opportunity to sit down with Ben Higgins and Lauren Bushnell last week to hear them talk more about their life after The Bachelor. I'm not a regular viewer of The Bachelor, so this was really my first opportunity to get to know the two of them. I watched the second episode of Ben & Lauren: Happily Ever After? just before they came in the room for our interview. The second episode of Ben & Lauren: Happily Ever After? is a must-see if only to learn how much Lauren enjoys pranks. In this episode, Lauren convinces Ben that he's going to sing the national anthem after throwing out the first pitch at a professional baseball game! In addition to the major prank, Lauren also played a few minor jokes on Ben. It was great to see her silly side and Ben was such a good sport about all of it, which makes the ideas even funnier. It was fun watching the episode then getting to have my questions asked by Ben and Lauren immediately after! 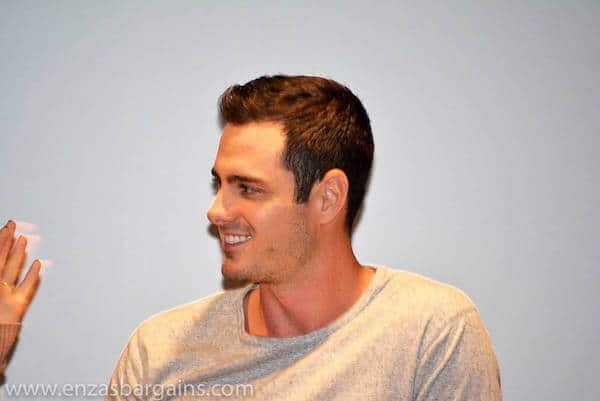 Ben Higgins on the question: Is Ben & Lauren: Happily Ever After? scripted? After the first episode a lot of people on social media were saying, “Ben & Lauren is so scripted.” I was like, just wait till next week, because nothing about that was fake. When I got the phone call from the baseball team, they asked, “Will you sing the national anthem and will you do the first pitch?” My immediate reaction was no. I'm a terrible singer. But because we're doing this reality show, I didn't even think I had the option to say no. Then I hung up the phone and I was like, Lauren, are you serious? And she said yeah. I was so nervous, I was sick to my stomach. It's one of my biggest fears. I just can't sing. I try to get her back when we do press, because it's live. So I try to drop little bombs on her where she has to try to fix it by herself. I've said she loves Cher and ask her to sing a Cher song. I don't know, I try but she's good at it. A few months ago we were in Indiana with my family. I see her kind of crawl across the living room floor. I can just see her feet, and she gets behind my parent's liquor cabinet. So I sat down. I wanted to see how long she can hide for. I think she was there for a good 10 minutes of laying on the floor. But then he ended up scaring me cause he saw me and he banged on the window. I was caught in the act. Lauren: We're trying to figure it out, because both of our families live in different places. That's something that a lot of couples go through. Ben's family is in Indiana. Mine is in Portland. So we're going to alternate Thanksgivings. This year we'll spend Thanksgiving with my family, next year with Ben's family..
Hopefully every Christmas we'll try to go great places. That's one of the great things about Ben & Lauren: Happily Ever After? It's allowed us to have a bit more flexibility when we're not filming. We can take two weeks around the holidays and go to each separate household. Ben: We have big plans. Ben: We're leaving LA and then we're going to Chicago, then Tampa, then we're going on a little vacation, to the islands, for a full week. It's our first vacation. There's going to be nobody with us, and we're going to stay through Halloween for that. Lauren: We get back to Denver on Halloween. I don't know if we'll dress up. I love handing out candy. Ben: I'll dress up. But we might just not come back. We might become island people. I think there's a lot of footage, so a lot of it is cut down and produced post0filming. The story is displayed and the story is shared. But there are times where we're getting ready to enter into a situation and we're like, what are we going to talk about? We just can't sit there the whole time. We want to make this as easy as possible. So some of the scenes just fill a gap. But our big life moments? That's just us. We do try to help our the crew and producers. If we want to do an activity, we'll do it on a day they're there. Blogger: Do people from The Bachelor hang out? How does that work? Jared is from my hometown, so sometimes I see him out with Ashely. How is that dynamic? Ben: Do they look like they're in love? Blogger: When I saw them, both their families were there. It was a charity event and it looked like he really liked her. Then I watched this summer and I felt really bad for her again. Ben: We're trying to figure it out, too! Ben: And the question: Do we hang out? Yeah. I don't think everybody does. There are people from my season of The Bachelorette that I just don't talk to, but there are some that I talk to quite often. I think that we have a shared experience that not a lot of people can relate with. Some of the people who have been the most supportive of our relationship are people like the twins. They were so supportive of us; they've seen us progress, they've seen the emotions of it all. With the show, for at least this short season of life, we get to do some really fun things. We get to go to events and on trips together, and it helps if you like the people. 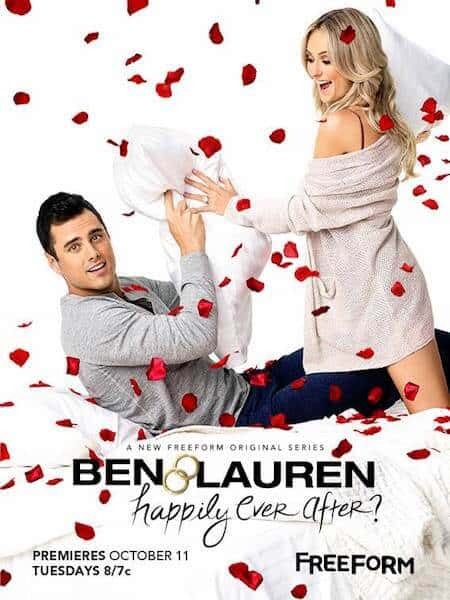 Blogger: I saw chat on the preview for the next episode of Ben & Lauren: Happily Ever After?. Is he really as big as a douchebag as he's made out to be? I have to know. Lauren: When we first met him at JoJo's, we talked to him and I felt so bad for him. I'm not saying that his actions were acceptable, but I just felt so bad. You don't know what he's going through at home or behind closed doors. I just wanted to talk to him. I thought he was very likable in my conversation with him, so we invited him to go camping. He's done things that are so very clearly out of line and acted a certain way, especially on social media. But I think I saw a different side of him, but I also saw why so many people have had run-ins with him. I don't know if he's being fake or not. Ben: The hardest part is that you come out of this feeling so happy. I ended up with this woman I'm so in love with and that I know is going to be the person I spend the rest of my life with. Then the next day you wake up and realize all the stuff that happened is actually going to affect our relationship. Like that I didn't tell Lauren that I told someone else I loved her. That I dated a bunch of other people at the same time I dated her. That I'm still a bachelor in everybody's eyes for the next five months. So we're engaged and falling in love and we're actually starting to date for the first time and going through the show (while it was on the air) was a difficult time. My strategy was to tell her everything right away. Be as truthful as I could. Let it sit and we'll work through it. It wasn't easy but it works. Ben & Lauren: Happily Ever After? airs Tuesdays on Freeform (formerly ABC Family) at 8/7c. The next episode airs October 25! 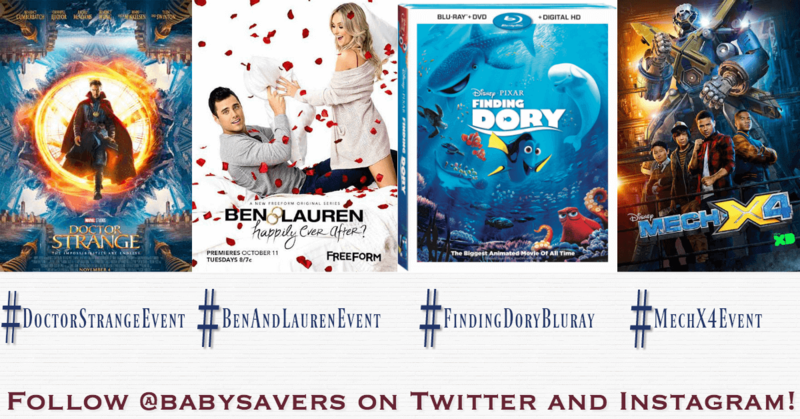 After you watch Ben & Lauren: Happily Ever After? stay on Freeform to watch The Letter. It's on immediately after, on Tuesdays at 9/8c. In each stand-alone episode, four friends draw names and anonymously write to the selected person a thoughtful, yet totally honest letter outlining their opinion of what needs to be changed in order to improve and transform their friend's life for the better. Interviewing Ben and Lauren was just one of several events I attended on this press trip. There's more to come, and I can't wait to share it! Thanks to Enza from EnzasBargains.com for the photos! Disclosure: Disney, Marvel, and Freeform flew me to LA and covered most expenses for this press junket. All opinions are my own.